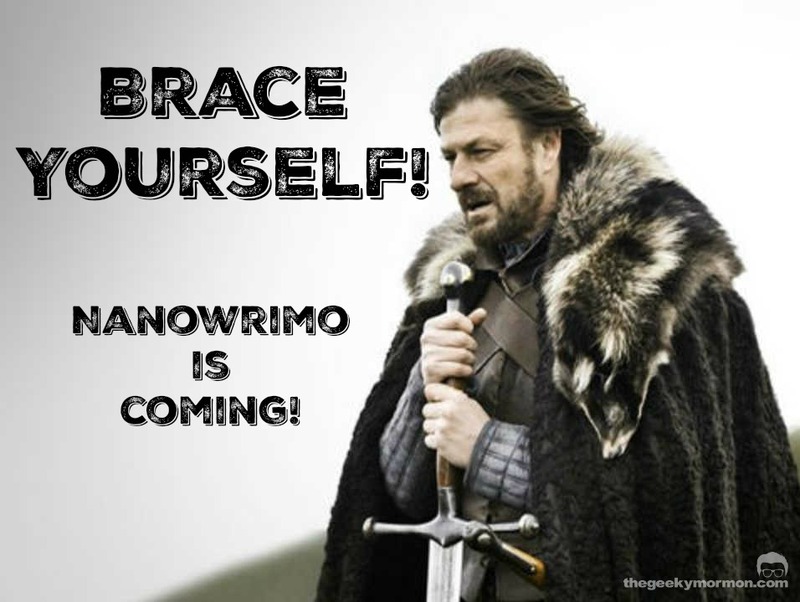 NaNoWriMo is coming up in November. For those of you who may not know, NaNoWriMo stands for National Novel Writing Month, and it is a real thing. No, seriously. It has its own web site and everything: NaNoWriMo.org. It happens every November, and the whole purpose is to get people writing books. To “win,” all you need too do is write a 50,000 word “novel” during the 30 days of November. That’s it. I have participated the last two years. I “won” in 2015 (meaning I had what looked like a novel with a beginning, middle and end, that was more than 50,000 words). In 2016 I was much less successful, and gave up part way through the month. My goal is to participate again this year, but I want to be more successful than the last two years. So, in the two months leading up to November, and in throughout November, I am going to be blogging about my 2017 NaNo journey. The months leading up to it will be talking a lot about my preparation, what things I am doing to get ready for NaNoWriMo. November, I will be checking in weekly here on the blog with a weekly word count and how the writing went for the week. What are the major differences between 2015 and 2016? Why was I able to finish one year, and not the other? I have been asking myself these questions over the last couple of weeks. I think it is important to look back on my work, see what has worked, and what hasn’t. This is what I came up with. I had heard about NaNoWriMo a few months prior to November, and I decided right away I was going to do it. It was a commitment I made to myself. I had a story idea that I was excited about, and I started right away on November first, and kept at it all month. Before the end of the month, I had banged out a 50,000 word manuscript. It was hard, but very rewarding. I remember being very tired by the end of the month. When I go back and read parts of my manuscript, it’s hard. It has a beginning, middle and end, but it stinks. It would need a complete and total rewrite, almost starting from scratch. Reading it, I can see that I had very little direction, and no idea who my characters were. Looking back, in 2015 I was dedicated, but had nor real plan or direction. I basically piled in a bunch of words, but never really built a solid story with solid characters. In 2016, I debated whether or not I was going to attempt NaNo again. Maybe I would take the year off, which was lame because I had only done it one year. That one year, though, the end result was so disappointing for me. I was discouraged right from the beginning. I could recognize that I needed to do better than I had the year before, but I felt like I couldn’t. As a result of going back and forth for so long, when November hit, I was sunk before I even got started. I had no motivation. I would sit down and write, and just wasn’t feeling it. Since then I have learned that the times when I’m just “not feeling it” are the times I need to push through and write. At the beginning, I started well, but then I took a day off, and then another, and just fell further and further behind, until I just gave up. I used to think of myself as a seat of the pants, or organic writer. I used to think my writing style was to just sit down at my computer and let the words and story flow. Nope, not how it works for me. I’m also not a planner. I a m not going to sit down and outline every moment of my story. That sounds too much like homework for me, and not enjoyable at all. I’ve learned I have to do something in between. I need to plan a little bit, have a roadmap down on paper, but I need to do it organically and be able to adapt my plan as the story flows. I have found a method that I think I am going to borrow from quite a bit, while making it my own. A guy named Rand Ingermanson came up with a method he calls the “Snowflake Method.” I like that it is focused on characters and developing them before putting the story down on paper. I also like that the story evolves and grows, from a one sentence summary to a paragraph to four pages and so on. This is the method I will be relying on heavily as I prepare for NaNoWriMo. I will be posting about this here, and I will be posting some of the content I write on my other site, jacobkdietz.com, the link for which is on the side of our site. This will be a lot of fun, and I am excited to share the journey with you guys. Also, it will be another way to hold myself accountable. For now, just know that a keyword for my NaNo this year is “Lightwalkers.” More to come next week. What about you? Are any of you doing NaNoWriMo this year? If you are we can connect on the site. You can find me as Jake Dietz. This entry was posted in Random Ramblings and tagged NaNoWriMo on August 31, 2017 by Jake Dietz.